Over the course of the summer we've seen plenty of posts and articles all over the internets telling us how to keep from losing all sanity during a family road trip with the kids. Which are all much appreciated tips, but we all expect kids to get restless and anxious. The best case scenario, they get sleepy and take a nap just when their iPod or iPad starts to run low. Worst case scenario you raise your voice to an authoritarian tone and make threats of no more ice cream stops. Either way you're the superior, the Alpha if you will, in this situation. You say what goes. But what do you do when it's just the "two of you", no kids, and the hours in the car start to take their toll? Usually, about 3 hours into the trip, idiosyncrasies start to pollute the environment. Whether it's a marriage, partnership, or we-don't-do-labels-ship this phenomenon will occur. In this case you are both equals, both adults, there is no way an authoritarian tone or threat will go over well with either party. Allowing any of this to happen could bring impending doom to your relationship. I'm certain that there have been plenty of relationships that crumbled halfway through a road trip. But fear not, as we have a secret weapon. As the old Benjamin Franklin adage goes, "an ounce of prevention is worth a pound of cure". 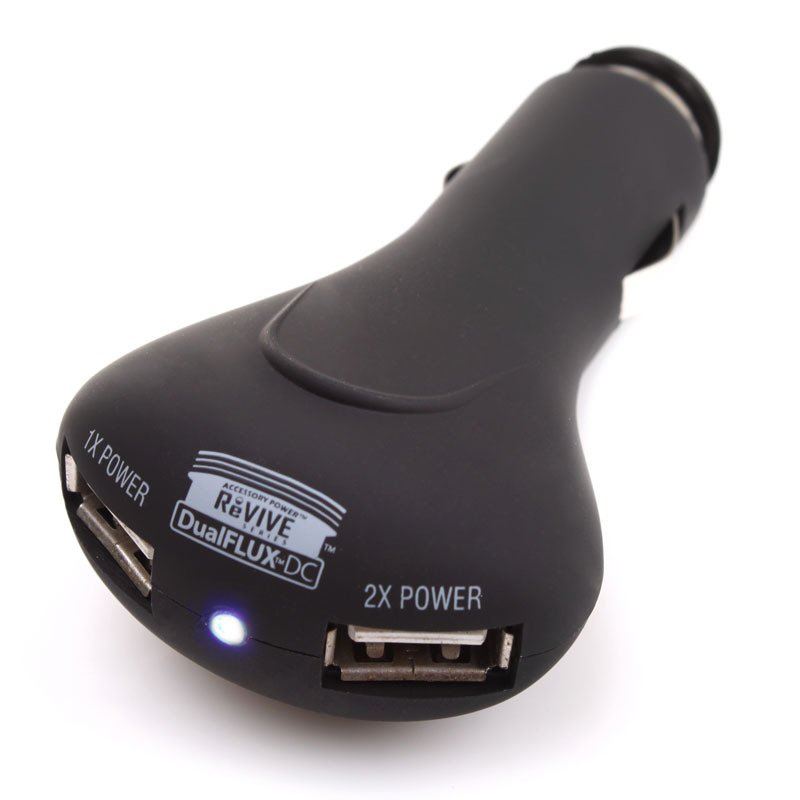 In this case the prevention is the ReVIVE DualFLUX DC Car Charge, weighing in at 1.6 ounces. Here's the secret to prevention part, the DualFLUX can quickly charge both a smart phone and a tablet at the same time from your car's DC outlet. In this era of handheld technology and constant connectivity what do we do when we want to avoid a confrontation? We start scrolling through our Facebook notifications, play an urgent game of Draw Something, or have that overdue face time chat with mom. And this is where the secret weapon comes in handy. Now neither of you have to worry about your battery dying, leaving you with no digital armor. And because the DualFLUX has two charging ports you'll completely avoid the chances of a lover's quarrel over whose turn it is to use the charger.